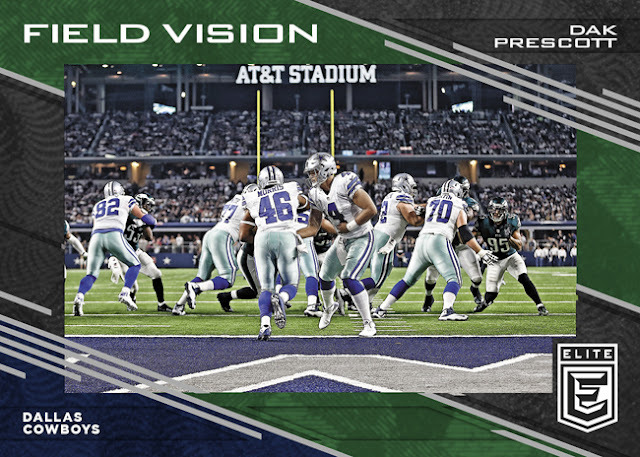 Panini America’s fabled Donruss Elite — triumphantly returned to the NFL last season with a dramatic new look, new card stock and some of the brand’s most storied inserts. The brand’s grand reintroduction last season was embraced by longtime Elite fans and newcomers alike. Wednesday, June 28, the transformation continues with the release of 2017 Donruss Elite Football ($112 per box). On average, each hobby box (five cards per pack, 20 packs per box, 12 boxes per case) will deliver two autographs (including at least one on-card Pen Pals) and one memorabilia card. The highlights of 2017 Donruss Elite Football are many and include . 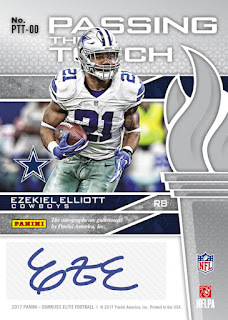 . .
Hard-signed Pen Pals autographs from the top 2017 NFL rookies — signed at the 2017 NFLPA Rookie Premiere — will fall once per box. 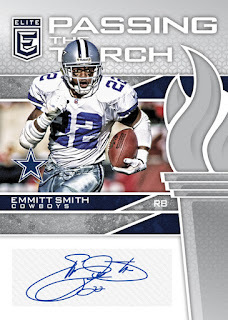 Autograph chases such as Pen Pals Ink Variations, Turn of the Century Autographs (printed on dazzling patterned card stock), the iconic Passing the Torch dual signatures, Back to the Future Signatures, Elite Signatures, Team Lineage and Impact Impressions (new for 2017). 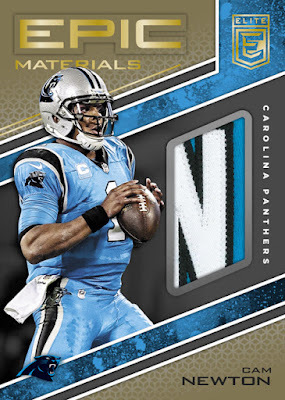 Classic memorabilia sets include Throwback Threads Singles, Throwback Threads Duals, Elite Coverage, Pro Bowl Standouts, Epic Materials and Prime Numbers. A captivating insert roster featuring Spellbound, Family Ties, Fired Up, Field Vision and Face to Face. Turn of the Century features top 2017 rookie autographs numbered from 149 all the way down to one. A Rookie Card subset featuring the league’s top newcomers and numbered to 499; parallel versions numbered to as low as one. 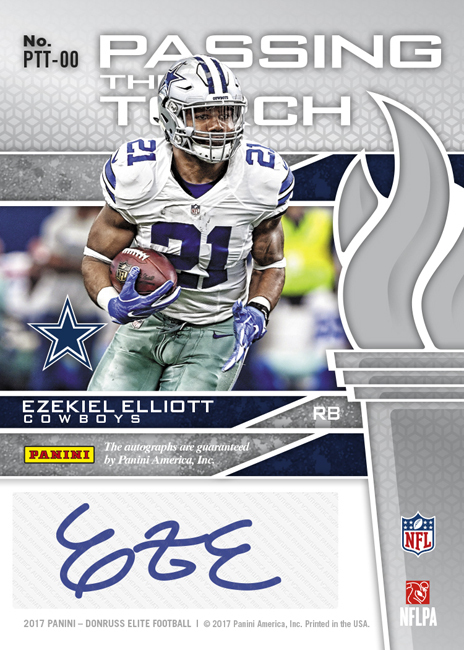 We’ll have much more to preview on 2017 Donruss Elite Football in the coming days. 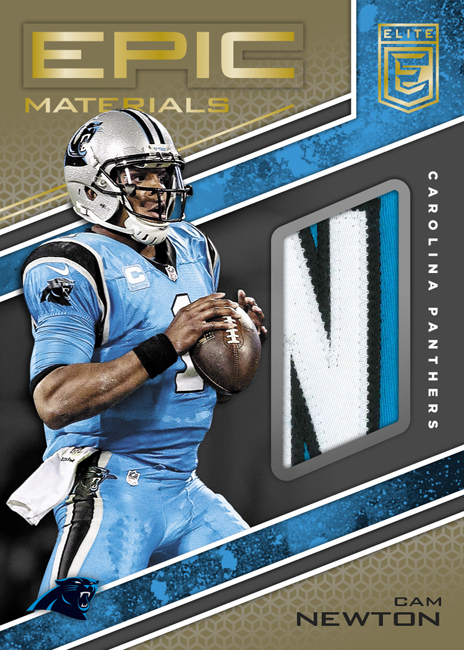 But for now, enjoy this sneak peek (keep in mind that the 2016 rookies featured in the preview gallery below are merely to show collectors what Donruss Elite’s various rookie designs will look like).